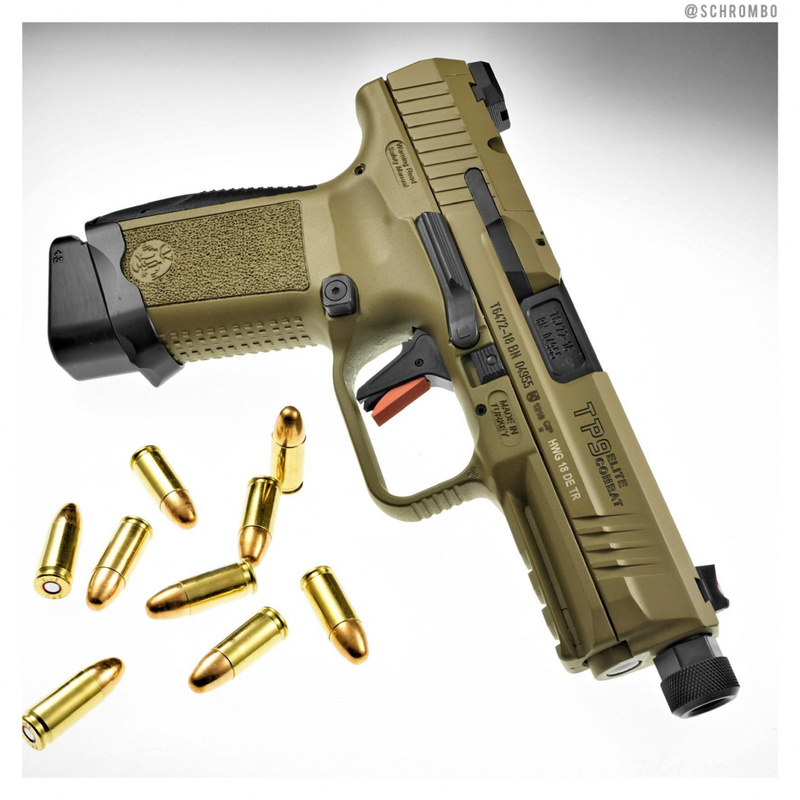 Today’s Photo is a Canik TP9 Elite Combat in 9×19 mm. The picture used with permission thanks to Schrombo – check his Instagram out in the link provided. I ordered this Canik TP9 Elite Combat at this years (read 2018) IWA in Nürnberg – and today it arrived. It’s a collaboration between Canik and Salient Arms, SAI designed the fluted barrel, the thread protector and the fibre optic sight. And boy, this pistol comes with the most complete set I’ve ever seen. In addition to the pistol, an 18 and a 15 round mag, the set contains a beefier backstrap, several interface plates for optic sights, a slide racker, an adjustable holster, four different sizes of mag release buttons, a barrel wrench (for the thread protector) and some cleaning utensils – all packaged nicely in a neat little case. “Threaded Barrel designed by Salient Arms International. Fluted and nitride-coated with a 13.5 x 1mm pitch. SAI-designed fiber optic front sight in red or green. SAI-designed blacked-out rear sight. SAI-designed speed funnel magazine well. I shot the TP9 (not the Combat Elite version, however) last year and it’s actually quite a nice pistol. Unfortunately, it was too cold to do a real test. Would you consider a Canik? Which model? Let us know below.